Senegal celebrates Independence Day. France gave up custody of the country in 1960. According to the CIA World Factbook, Senegal is a bit smaller than the state of South Dakota. Located in western Africa, it borders the Atlantic Ocean. Plains cover most of the country, but some jungle grows in the southwestern portions. About thirteen million people live in the country. Dakar is the capital. United States flag with thirteen stripes and a star for each state was adopted in 1818. Prior to this time, a star and stripe was added each time a state was admitted to the Union. By 1817 the flag had twenty stripes and twenty stars, and the flag was becoming cumbersome. Samuel Chester Reid, a naval hero of the War of 1812, suggested the stripes remain at thirteen, and the number of stars change as new states joined the union. 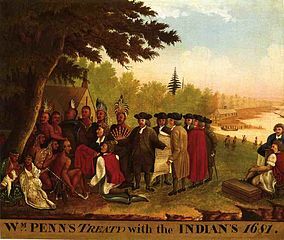 Children could view a timeline of the American flag at: http://www.ushistory.org/betsy/flagfact.html. Vitamin C was discovered by C. G. King in 1932. Vitamin C, also known as ascorbic acid, builds strong bones and teeth. It speeds up the healing process of wounds. Idea: Vitamin C is found in citrus fruits, tomatoes, potatoes, strawberries, cantaloupe, and cabbage. 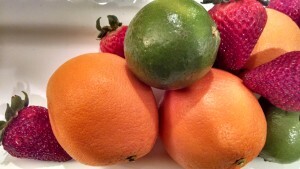 Children could make a fruit salad of strawberries, melon, and oranges. Discuss the benefits of vitamin C as children enjoy the treat. Older children can learn more at: Vitamin C.
North American Treaty was signed in 1949. 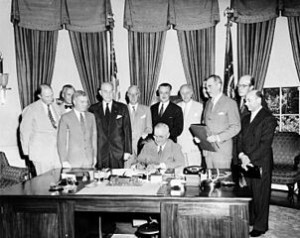 Twelve nations formed the original North American Treaty Organization: Belgium, Canada, Denmark, France, Great Britain, Iceland, Italy, Luxembourg, the Netherlands, Norway, Portugal, and the United States. Greece and Turkey became members in 1951, and West Germany joined in 1954. Spain became the last member in 1982. The main purpose of NATO is protection; an attack against one member is an attack against all members. Idea: Children could locate these countries on a world map and decide whether all countries benefit equally from this treaty. Maya Angelou (born Saint Louis, Missouri, 1928; died Winston-Salem, North Carolina, May 28, 2014) was an author and a poet. One of her most famous books is I Know Why the Caged Bird Sings. Children can learn more at a site devoted to her: Maya Angelou. Dorothea Lynde Dix (born Hampden, Maine, 1802; died Trenton, New Jersey, July 17, 1887) fought for social reform, especially regarding jails, insane asylums, and orphanages. Children could read Breaking the Chains: The Crusade of Dorothea Lynde Dix, by Peggy Colman. Phoebe Gilman (born New York New York, 1940; died Toronto, Canada, August 29, 2002) was a picture book author and illustrator. Her works include Grandma and the Pirates and Jillian Jiggs. Children could learn more at: Phoebe Gilman. Edward Hicks (born Langhorne, Pennsylvania, 1780; died Newtown, Pennsylvania, August 23, 1849) was a self-taught artist known for his many Peaceable Kingdoms. Children can see some of his works by visit this website and clicking on the names of the paintings: Edward Hicks. Elizabeth Levy (born Buffalo, New York, 1942) has written over 100 children’s books. Her books include the Fletcher mysteries, the Something Queer is Going On series, and the Jodi and Jake mysteries. Children can learn more at: Elizabeth Levy. Johanna Reiss (born Winterswijk, Netherlands, 1932) writes books for children. She moved to the United States during the 1950’s. She wrote The Upstairs Room, a memoir of her growing up during World War II. The book received a 1973 Newbery Honor Award and a Jane Addams Peace Association Honor Award. Her other books are also autobiographical. Children can view her website at: Johanna Reiss. Glen Rounds (born near Wall, South Dakota, 1906; died Pinehurst, North Carolina, September 27, 2002) wrote and illustrated at least 100 children’s books. His works included Ol Paul, the Mighty Logger and Wild Horses of the Red Desert. Children could learn more at: Glen Rounds.